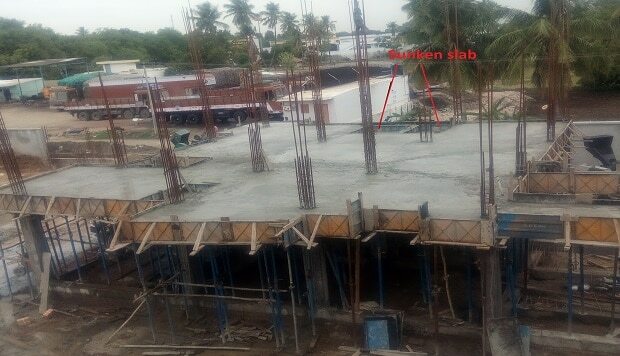 Sunk slabs are slabs which are cast at a certain depth (200 or 300 mm or any other depending on design) below normal floor level. This extra depth is used for placing pipes and utility ducts. 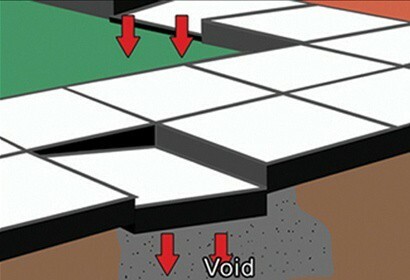 And then space is filled with sand or other light weight materials until the normal floor level. 1. The concrete of the R.C.C. (floor and sunken slab) should be mixed with a waterproofing material to get a denser, watertight concrete. 2. Then cement and waterproofing material should be diluted in water and splashed onto the RCC sunken slab. 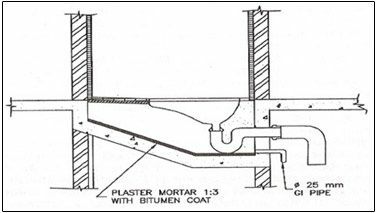 Over that, a layer of plaster should be provided using a mortar plasticizer with the cement mortar. 3. Brick laying of walls and plastering (prior to tiling) of the walls and floor should be done with cement mortar mixed with a mortar plasticizer. 4. Tile fixing for the floor and walls tiles should be done with non-shrink, waterproof tile adhesives to make the tiled area waterproof. 5. Sanitary pipe joints should be sealed with sealants specially manufactured for sealing sanitary joints firmly so that no water can leak through. 2. Porch slab: here the beams are inverted so that the beams do not protrude down side and a plain surface is available. 3. Mid Landing on a staircase: The end beam is designed as an inverted beam so that there is adequate head room available below the landing. I want learn about concrete techniques.